A pleasant album of themes from various movies, seamlessly performed for an appreciative audience by five able musicians whose earnest labors affirm that there is an abundance of talented artists in this country whose endeavors pass largely unnoticed unless concerts such as this one are recorded and released so that a wider audience is able to hear and appreciate their proficiency. Saxophonist Tom Artwick leads the quintet, and he is a pleasure to hear on alto sax, tenor or flute, as are his teammates, trumpeter John DEarth, bassist Paul Langosch, drummer Robert Jospe and especially pianist Bob Hallahan, as engaging an accompanist as he is a soloist. Although the album notes don't say so, all of these gentlemen live and teach in Virginia, Hallahan at James Madison University, Langosch at Virginia Tech, D'Earth and Jospe at the University of Virginia, Artwick at Washington & Lee University in Lexington, where the concert was taped in March 2013. In spite of a few curious choices ("The Odd Couple," "In the Heat of the Night"), Artwick and Co. make everything work, thanks in large measure to splendid charts and admirable blowing by all hands. Langosch introduces "Heat" with a minute-long unaccompanied bass solo, leading to the tune's bluesy core, epitomized first by Artwick's tenor and D'Earth's trumpet, then by Hallahan's evocative piano. Artwick opens the concert on alto ("Pure Imagination," "Alfie") and returns to it on Michel Legrand's "Chanson des Jumelles" and "Chanson de Maxence," both from the film Les Damoiselles de Rochefort. He plays flute on Mack Gordon / Harry Warren's lovely "I Wish I Knew," Quincy Jones' "Happy Feet" and Luiz Bonfa's "Samba de Orfeu," flute and tenor on "Charade," tenor elsewhere, in every instance deftly supported by D'Earth's assertive trumpet. "Alfie," composed by Leslie Bricusse and Anthony Newley, is followed by Sonny Rollins' "Alfie's Theme," on which Atwick plays tenor, as he does on "The Odd Couple," "Heat of the Night" and Henry Mancini's well-known theme from "The Pink Panther." Hallahan is delightful on "Happy Feet," as he is whenever given room to solo. As for Langosch and Jospe, they work well with Hallahan to comprise a first-class rhythm section. Jazz Scenes is a charming concert, well-recorded and commendably performed by musicians who may be relatively unknown but are well-schooled professionals (no pun intended) who know how to brighten a song. Track Listing: Pure Imagination; Alfie; Alfie’s Theme; I Wish I Knew; The Odd Couple; Charade; Chanson des Jumelles; Chanson de Maxence; Happy Feet; In the Heat of the Night; The Pink Panther Theme; Samba de Orfeu. 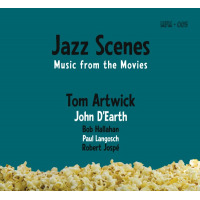 Personnel: Tom Artwick: saxophones, flute; John D’Earth: trumpet; Bob Hallahan: piano; Paul Langosch: bass; Robert Jospe: drums.